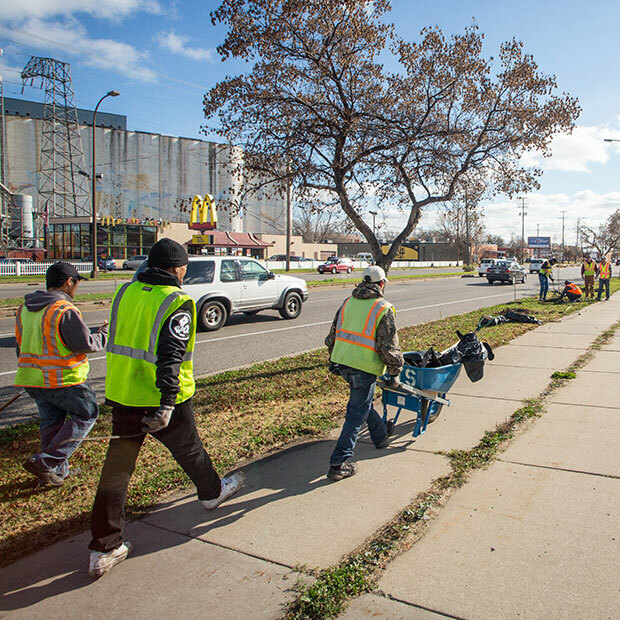 Mowing lawns, removing snow and maintaining public parks all are part of Hennepin County’s Sentencing to Service program, which provides community improvement work opportunities in place of sentences for low-level offenders. Participants learn valuable skills and work to restore communities instead of paying fines or serving jail time. Experienced crew leaders supervise the workers, who meet their required community service hours in a structured way. "We want to make this a real model of work,” said John Ekholm, corrections program manager. To get that experience, workers must be on time, follow crew leader instructions and bring a lunch like any other job, he said. Communities and towns can request a Sentencing to Service crew to help with tasks including invasive species removal, park maintenance and storm damage cleanup. The program trains participating offenders, arranges crew transportation and provides proper tools and equipment to complete the project. According to Ekholm, both the workers and the communities they serve see a positive difference from the program. Crew workers often change their attitudes over the course of the workday after they see the tangible results of their work, Ekholm said. Workers are carefully screened before project assignment, and professional crew leaders maintain a safe and productive environment for workers and communities. Leaders work alongside their crews, which Ekholm said improves morale and boosts productivity. “We get a ton of work done,” he said. Both adults and juvenile crews are available for hire, and crews number about 10 workers. An average crew costs $336 per day, though some services are free. See the “Want to hire a Sentencing to Service crew?” tab on the program page for more information.